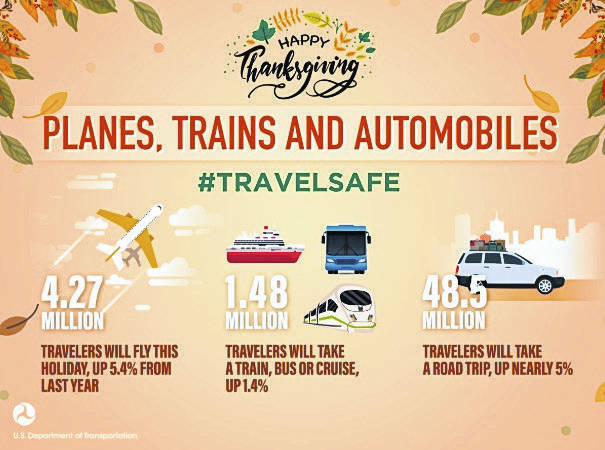 WASHINGTON – With tens of millions of Americans expected to spend some portion of the Thanksgiving holiday on the road, the National Highway Traffic Safety Administration (NHTSA) reminds motorists to plan ahead to make sure everyone makes it to the table safely. NHTSA Deputy Administrator Heidi R. King released a video message urging holiday travelers to drive at a safe speed, avoid texting and driving, wear seat belts properly, ensure children are buckled in the right seat for them, and to drive sober. Don’t drive distracted. Pay attention to the road. Texting is the most alarming distraction. Sending or reading a text takes your eyes off the road for 5 seconds. At 55 mph, that’s like driving the length of an entire football field with your eyes closed. Teens are the largest age group reported as distracted at the time of fatal crashes.